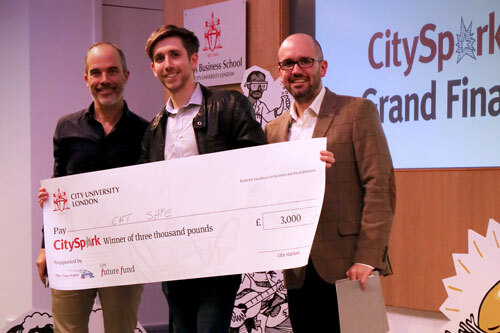 Five student teams with innovative business proposals took home £3,000 prizes at the CitySpark Grand Finals this week. City’s student innovation competition aims to inspire and support the next generation of entrepreneurial talent. Ten teams of students were selected to pitch their ideas to a panel of esteemed business experts for the chance to win funding to further their project. The event also allowed the teams to network and get feedback on their business idea. The panel of judges included Samuel Lehane, Head of Parnerships at Virgin StartUp; Darren Shirlaw, Co–founder of Shirlaws; Adam Cooke, Delivery Consultant at Visa Europe Collab; Michael-George Hemus, Founder of Plumen and Caroline Wiertz, Associate Dean of Entrpreneurship at Cass. Head of entrepreneurship at City, Alex Elkins said the event was a "great showcase" of the very best entrepreneurial talent at City. The level at which our student and graduate entrepreneurs are performing is truly compelling and an inspiration for us all. City entrepreneurs don’t just identify problems, they seek out to solve them using innovation, creativity and gumption. The quality of entries this year was incredible, providing an unenviable task for the judges to pick the winners. CitySpark is merely the start of the entrepreneurial journey and I hope to see all our finalists pursuing their business ventures, achieving amazing things and becoming our very own innovators of the future. Archtor is a customisable, mechanical gaming keyboard. The keyboard, powered by Archtor software, allows the user to change the display of the keys. This is controlled through an LCD RGB Backlit screen embedded in each keycap. It functions as a versatile keyboard which can be used in any language, any layout and with any software or game. 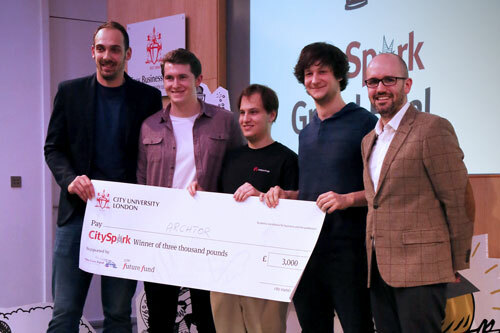 Winning a CitySpark competition gives you financial support, but importantly it also gives you the chance to spread the word about your idea and share it with others. It also provides the opportunity to get feedback on your idea which is crucial at this stage. Eat Safe is a restaurant directory app that allows people with dietar y restrictions find new places to eat out that are safe for their diets. Consumer can select which restrictions they have, look for local restaurants on the system and see the menu items that are safe for them to eat. This provides restaurants with a means of effectively complying with the legal requirement to store allergy information while tapping into a large underserved market. I met a lot of people at the event who will be a great help in the next steps. Overall, it was a fantastic opportunity to learn how to develop a business concept into a viable idea. Matt says they will use the funds to start the app development process. They hope to exhibit this at the Free-From food festival in May. Twipes are hygienic, water-dispersible wet wipes designed to fit into existing toilet roll holders. The wipes are alcohol and paraben free, meaning that continual use doesn’t dry out skin or doesn’t cause irritation. Twipes also dissolve in water within three hours making them an environmentally-friendly alternative to existing wet wipes currently on the market. The team said they were “over the moon” to have been named a winner. It’s an incredible feeling. It’s not so much about the money, but the external validation we received from the judges and the attendees. Seeing how excited other people were about our idea just made us even more excited. 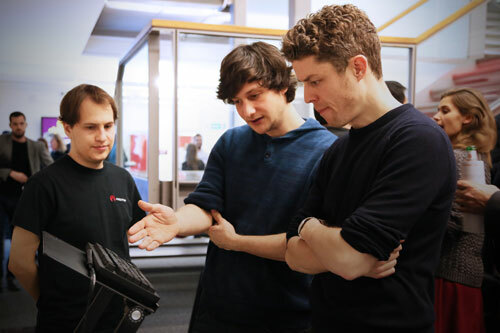 The team will put the funding towards researching and designing their product. Their website will go live in April and from there will begin to take pre-orders. BookBall is an online booking platform that connects players with sports facilities in London. BookBall will allow customers to go online, search for local facilities and book them in a matter of clicks. Simultaneously the platform provides the sports facility a simple and intuitive way to manage their bookings. The idea was borne out of frustration with the existing time-consuming process involved in booking a tennis court or football pitch. The BookBall team are now working on a beta version of the platform. They will use the £3000 prize fund on programming so that they can showcase the idea to potential business clients. Binta’s Kitchen aim to create healthy, versatile and convenient food products, incorporating authentic African flavours. Their flagship product is a traditional Tomato & Red pepper sauce. The team aim to help busy, health-conscious people to enjoy nutritious meals that are easy to prepare. 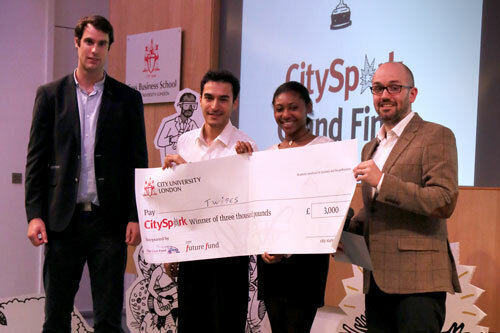 CitySpark is the student innovation and enterprise programme at City University London.